Canadian Gordon Bowman is proposing to publish a book detailing his fathers romantic mid-century journey across the Americas. The Kickstarter page details the project and levels of financial participation. The manuscript is complete and a publisher is sought; with this being the goal of the project. Head over and take a peak at some of the cool photos. The masked bandit photo is what caught my eye. 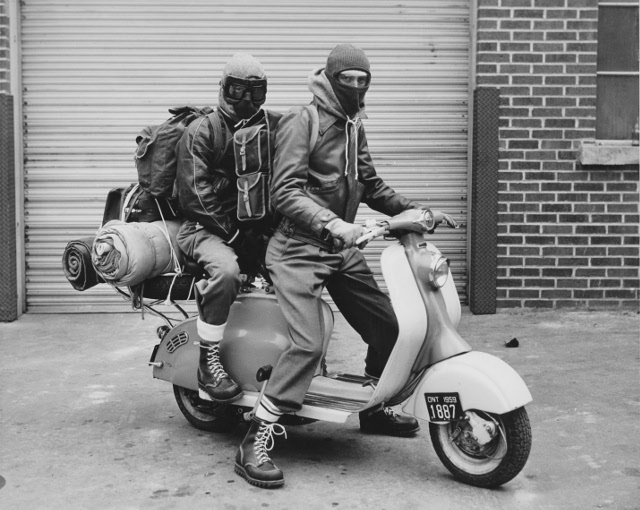 Just about the coolest scooter snapshot I’ve seen in a while. 2013 SIP Customshow Winners Announced. The results for awards at last weekend’s SIP Customshow in Landsberg, Germany are shown here. 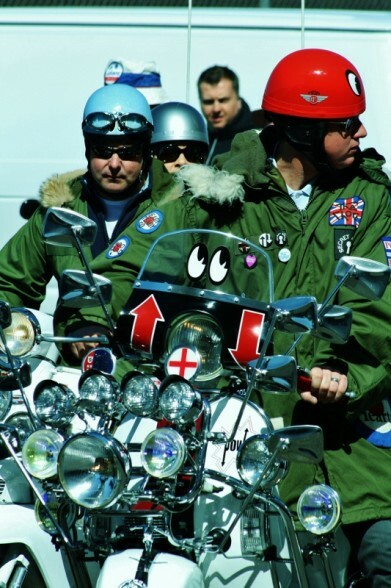 The show is one of the largest and never fails to have a few examples of custom scooter eye-candy. Some winners have been seen before but are worthy of praise nonetheless. My favorite winner is the Best Smallframe. But the best name for an award is Maximum Respect, and seeing the winner explains it. Very nice. Author BrookePosted on 16.04.13 Categories Germany, Oddities/Customs, Scooter News3 Comments on 2013 SIP Customshow Winners Announced. Hodgespeed let us know that SIP is currently in the process of making tooling to produce Vespa smallframe PK-style engine cases. Great news in itself, as they’d gone out of production, but to me, the interesting part of the post is the CAD drawings of the mold for one side of the case. You hear a lot of people saying “Why don’t they just make….” Here’s the answer, look at the complexity and SIZE of that mold, and that’s just for one case-half (engine cases having two halves, you see.) So knowing that SIP has invested tens of thousands of Euros already, with all the machining and production costs to come, and testing, and the concern that the demand might be less than anticipated, or any tiny mistake in engineering or quality control could be disastrous, it’s a wonder they’ve taken on the project, though I’d wager most scooterists are certainly glad they did. Now, a note, because everytime I post something like this, I get emails once a month forever from non-english speakers: 2strokebuzz does not sell this or any scooter parts. If you are interested in this product, please contact SIP in Germany. Saigon Scooter Center has thrown their hat into the electric scooter ring. It’s not another new Lambretta rumor, but a conversion of old to new. Vespa and Lambetta models appear, named VTronic and EBretta respectively. It’s a bit disappointing that they stuff a behemoth of a 13″ wheel in the back. And the custom cowl on the P-series conversion looks a bit off. But hey, they are making options for the people that want their transportation energy to not come from fossil fuels. At least not fossil fuels burned near them while riding. Brits must have excellent eye sight. Most of their websites rely on the smallest photographs possible to differentiate products or events from smudges on the screen. Brit Ex-pat run SSC sustains the long tradition even overseas. Long live the Queen. Check out the photos and description here! 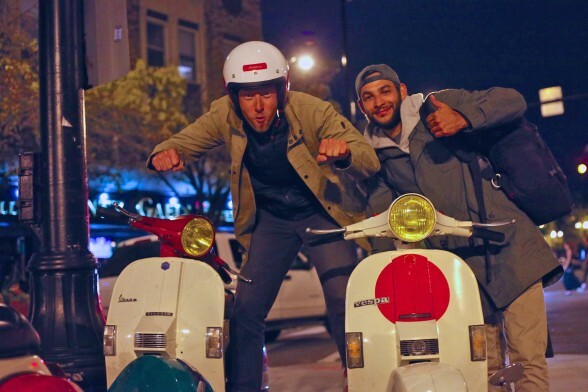 Any readers riding electric scooters right this moment? Home brew, conversions or off the shelf? 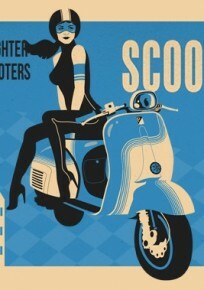 MotoBlog.it reports Vespa World Days 2012 in London ended today with record numbers: over 3,000 scooters, 780 clubs represented, and 2000 members at the gala dinner. Vespa Club Sirmione won the “Trophy Club Race” with over 1,600 of the 1,752 checkpoints scattered across Europe. This, of course, makes Amerivespa seem puny in comparison, but that’s not gonna ruin my fun this weekend. 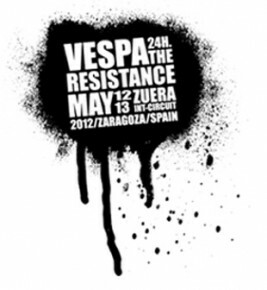 This weekend is the annual international endurance classic scooter race in Aragon, Spain known as Vespa The Resistance. It looks like a top notch group of people that organize a fun weekend. Several scooter shops send teams and someday I hope to see an American entry! Check them out on Facebook, Twitter or Youtube.